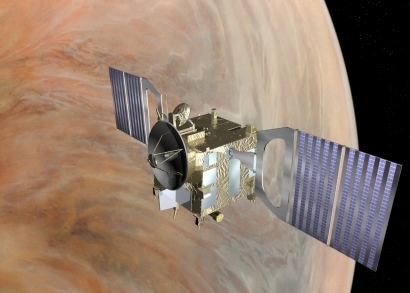 After a launch delay of several days, Venus Express is now all set to go. The European spacecraft dedicated to studying the atmosphere of Venus will launch atop a Soyuz-Fregat vehicle on 9 November from the Baikonur Cosmodrome in Kazakhstan. CNES is a partner on this mission. Europe’s Venus Express probe is now set to lift off on Wednesday 9 November atop a Russian Soyuz-Fregat launcher. The journey to Venus will take 153 days, plus a further 5 days to move into orbit about the planet. Originally scheduled in October, the launch had to be postponed after contamination was detected inside the Soyuz fairing. 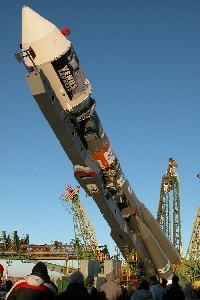 Additional inspections and cleaning of the top section delayed the launch several days. Soyuz-Fregat is now ready to launch from the Baikonur Cosmodrome in Kazakhstan, where it has been on the launch pad since 5 November undergoing final preparations. 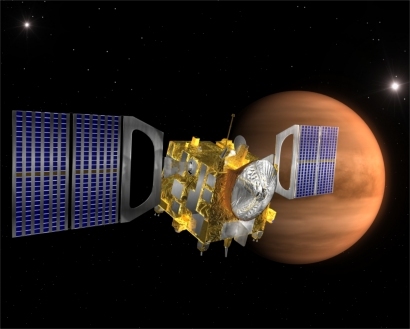 Venus Express is the 1st European spacecraft dedicated to observing Venus from orbit. The probe will fly around Venus in a quasi-polar orbit, at an altitude of 250 to 66,000 km. For 2 Venus days (equivalent to 500 Earth days), Venus Express will analyse the planet’s atmosphere, ionosphere and volcanic activity. CNES is involved in this European mission and is contributing to 3 science experiments. The Virtis1 and Spicav2 spectrometers will analyse the planet’s atmosphere, while the Aspera-43 instrument will study its ionized environment. The Venus Express mission has taken only 4 years from concept to launch. The project got underway in 2001 and the satellite is derived directly from Mars Express and re-uses some of its subsystems. 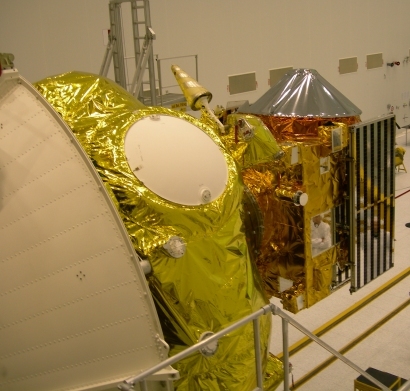 ESA selected EADS Astrium to build the spacecraft in October 2002.